Every time Aleksandra (Sasha) Kasman plays the piano, she reaches for new musical milestones. Recently, she won a national concerto competition in Tennessee. 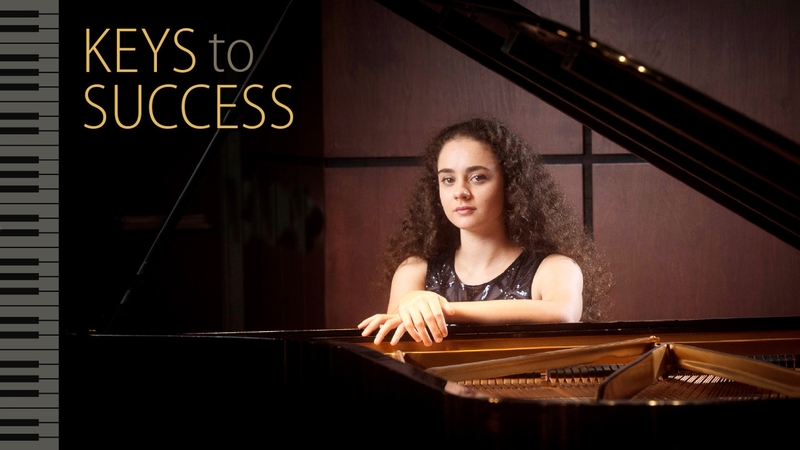 Last summer, she took first place in the prestigious International Keyboard Institute and Festival in New York City. The latter competition was especially memorable, says Kasman, a junior in the UAB College of Arts and Sciences Department of Music and UAB Honors College University Honors Program. “I took open lessons from some of the biggest names in piano and attended concerts by famous pianists,” she says. That mindset fuels Kasman’s success. Her numerous awards include a silver medal at the VII International Competition for Young Pianists in Memory of Vladimir Horowitz, second place and Young Jury Winner Award at the Arthur Fraser International Piano Competition, a PianoArts North American Competition Scholarship Award, and winning performances at the NFMC National Collegiate Piano Competition and the High Point University Inaugural Piano Competition. Sasha’s father, UAB piano professor and artist-in-residence Yakov Kasman (pictured below)—her piano teacher for nearly a decade—has helped inspire her work ethic and love for music. “Being successful today means you must keep working, or you will be forgotten,” he says. Yakov Kasman sensed his daughter’s musical ability once she started tinkering on the piano at age 2, when the family lived in Moscow. In 1997 he won the Van Cliburn Competition’s silver medal, earning him a concert tour. His performance in Huntsville, Ala., wowed engineer Bill Lindberg, who arranged for the pianist and his family to move to Alabama. Yakov Kasman joined UAB’s faculty in 2002. Meanwhile, Sasha began taking formal lessons from her mother, Tatiana, a Moscow Conservatory graduate, at age 6. Yakov began training Sasha at 12. During practice, Yakov says, he must see Sasha as his pupil, not his daughter. “We become teacher and student, which can be harsh,” he notes. “And the moment the lesson ends, the harshness disappears.” Father and daughter say one role doesn’t affect the other. “They live almost parallel,” Yakov says. However, both speak of a special chemistry whenever they practice or perform together. “There’s this electricity,” Sasha says. “We’re two parts of a whole making one piece of music.” Sasha has performed with her father around the world in addition to her own international solo recitals. Sasha now has her own piano students, kids between 7 and 10. Balancing teaching, practicing, and performing with college and family life is perhaps her toughest challenge yet. Recently, her calendar included a UAB recital, concerts in multiple states, a PianoArts fellowship in Wisconsin, a performance with an orchestra in Ukraine, and recording sessions in Italy for her first album—in addition to a full course load. Sasha also is planning her future, including a doctorate in musical arts and a career in teaching and performing. “It gets a bit overwhelming,” she says. • Discover the academic and performance opportunities available through the UAB Department of Music. • Give something and change everything for UAB music students.